With 20 years of history, Wan Hao is a high-end restaurant sitting in Singapore Marriott Tang Plaza Hotel along Orchard Road that serves classic Cantonese cuisine. Standing on the 5th level, the exterior that invites your entrance is dark and elegant, until you passed through the alley way and enter the main dining area which is bright and spacious with a classic style of decor. For more privacy, there are rooms that are enveloped in a quiet simplicity and perfectly spaced for family gatherings or a business luncheon. To celebrate the 20th anniversary of Singapore Marriott Tang Plaza Hotel, the restaurant has recently launched a menu featuring 20 of their all-time favorites, such as Beef Tenderloin served with Sour Plum Fresh Pear and Lotus Leaf Rice. 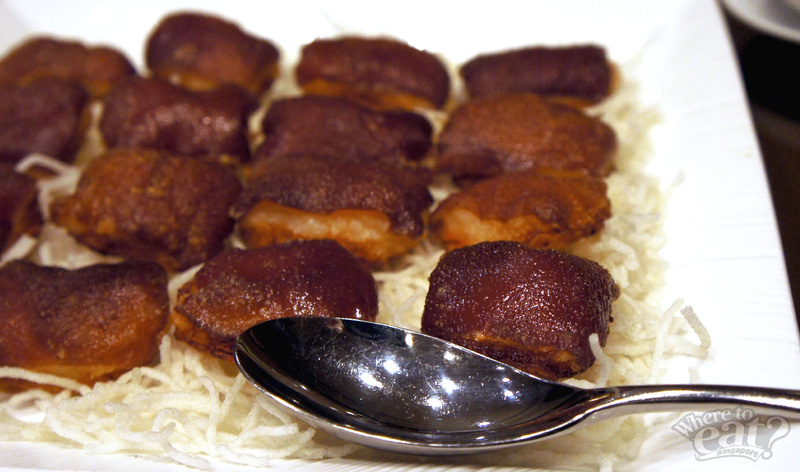 To start off this special menu, we have the Crispy Suckling Pig with Prawn Paste to keep things extravagant. The crunchy texture of the pig’s skin with firm chunks of prawn paste fillings makes an interesting combination. Don’t be fooled by the translucency of this soup. You’d be shocked to taste maximum seafood freshness in from spoonfuls of it. 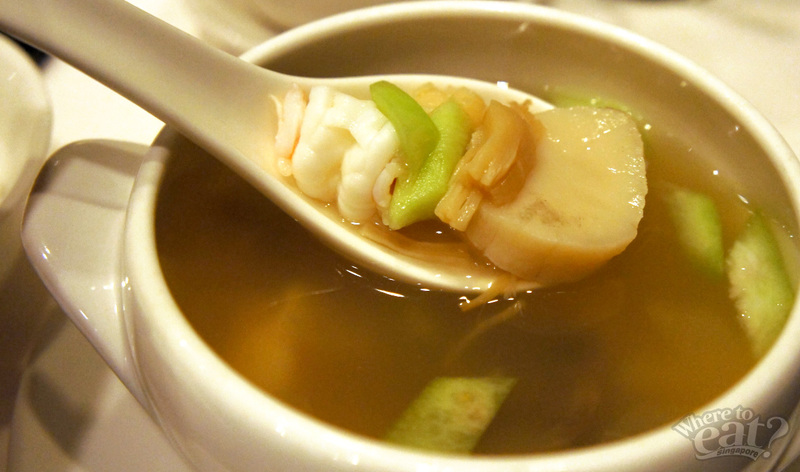 Also, expect to find Lotus seeds within the exquisite flavor of this subtle, light soup. 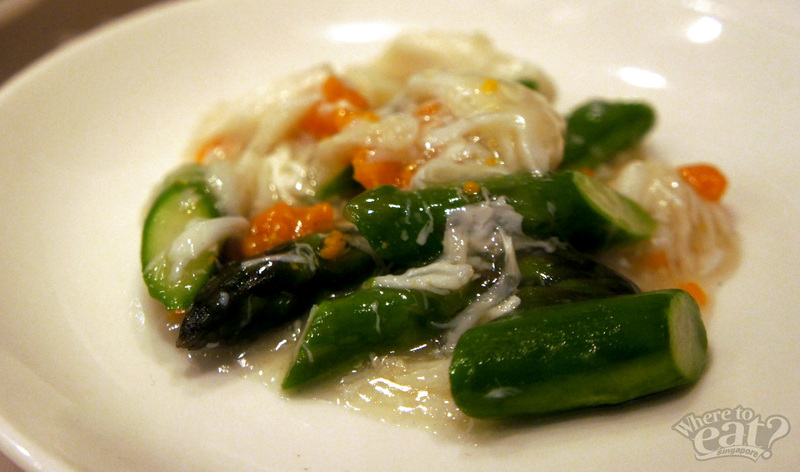 Cantonese cuisine are all about delicacy, and this particular dish is the perfect epitome of it; fresh crab meat and a generous amount of crab roe in a pool of smooth egg white sauce will slide down your throat when you least expect it. Another dish worth mentioning is the Pan Fried Scallops. Modestly presented, this dish leans slightly to a heavy-handed approach compared to the others on the menu. 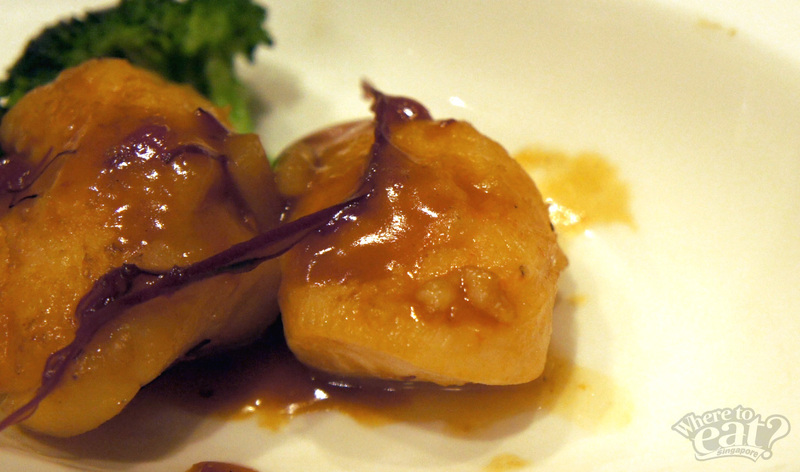 The spiciness delightfully brings out the sweetness of the scallop, resulting in a rewarding blend of satisfying flavors. The premium beef is sizzled to deliver a bite that’s firm and moist. 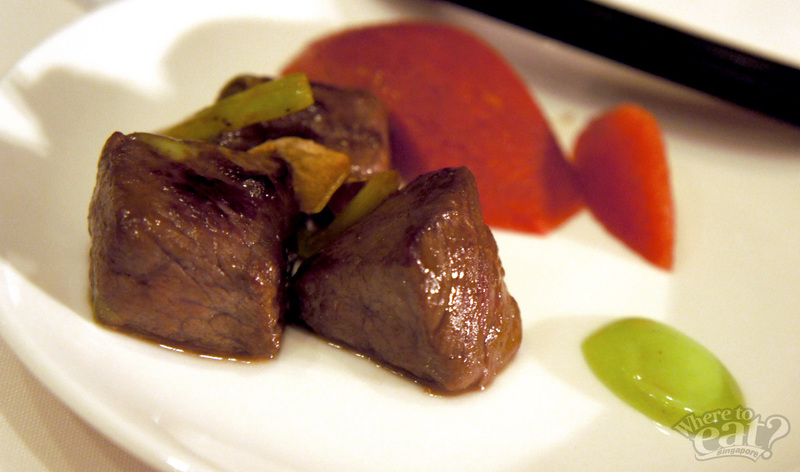 Dip it in the specially-made Wasabi sauce and top it off with a little piece of sour plum pear, and you get a surprising complement to the lean and fat of the tenderloin beef. A Chinese meal wouldn’t be completed without a serving of carbs, and not that we mind it. This easily overlooked dish is indeed traditionally Cantonese, serving a lovely rice mixture with two different kinds of Chinese sausages (腊肠 and 润肠), waxed meat and Chinese mushroom bits. 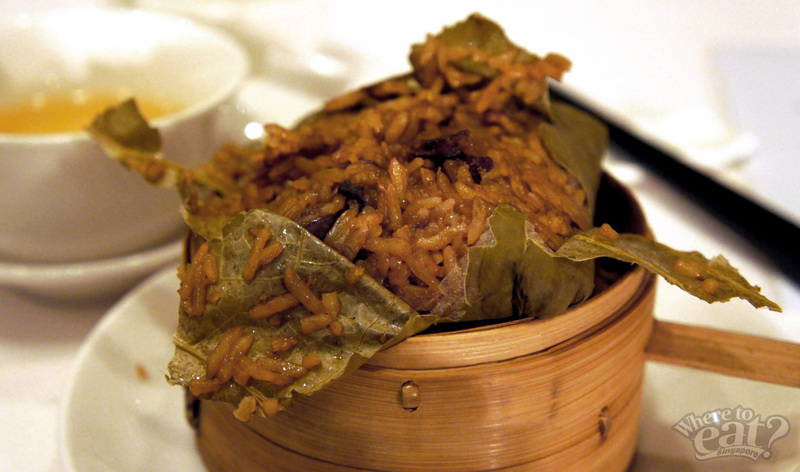 Cantonese are fussy about their rice, and this dish does it right with its fluffiness, moistness and its exceptional fragrance. Perk up your taste bud with this refreshing dessert thought out by the chef team. The presentation really is something – what’s most impressive about it is that it taste just as good. 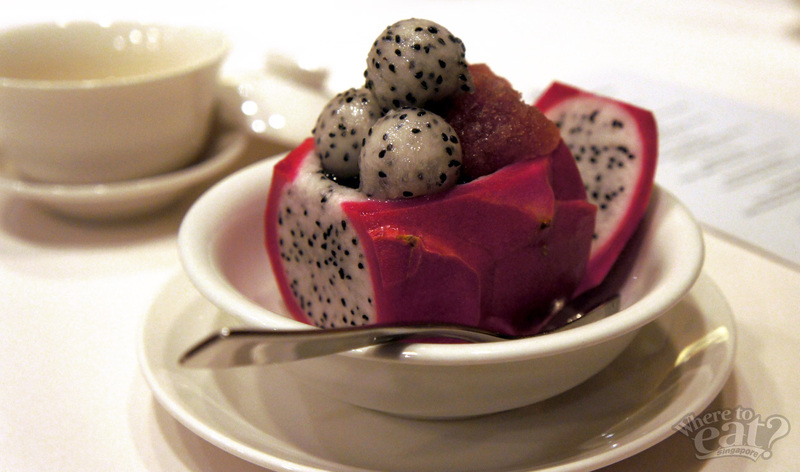 Every spoonful promises a slight alcoholic punch, a tang from the lemongrass jelly and natural sweetness from the dragon fruit.